Gokarna is a town of contrasts, as it is a temple town and also a holiday destination by the sea. It is an attractive town with two main streets having shops and traditional tile-roofed brick houses. Hotel ASHOKAVANA is located in the entrance of the town to left side to the OM BEACH road and at walkable distance from the beaches and temples. 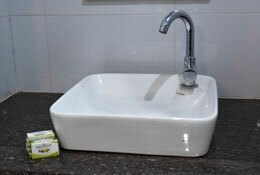 The hotel is very clean and affordable with friendly staff and caring management. Hotel ASHOKAVANA provides easy access to every other part of Gokarna. It is just 600m from Gokarna bus stand and 1.3km from the temple. OM beach and KUDLE beaches are just 5km far from this hotel. 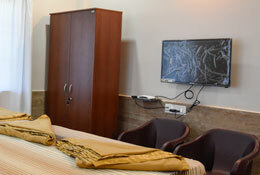 Hotel ASHOKAVANA has double deluxe and triple rooms with with AC, LED TV and hot water facilities. It serves pure Vegetarian, South and North Indian foods. The nearest railway station is 20km far from this hotel. The nearest airport is the Goa airport. The second best option would be the Mangalore airport. Gokarna is about 170KM away from Goa, About 3hrs and 30mins drive from Goa to Gokarna. 4hrs drive from Mangalore to Gokarna. © 2019 Hotel Ashokavana. All rights reserved.